Interesting how the author has created a main character with the all the ingredients to be perfect and yet he isn't. Ruled by his biological functions and inability to say no to a pretty face Steel turns out to be just a typical man. I admit the intent to do good is there but pesky little things like treasure hunts and beautiful women keep distracting him.I would have enjoyed more focus on the mystery of the treasure. The more intricate factual details of where, when and how seemed to drift off a little towards the second half. The first half is written with the focus on a mixture of historical events,The author shows a keen understanding of the native culture, the inhabitants and the political atmosphere of the country. That is his strength and ultimately what made this an interesting read. I think the author should use that barrel of personal experience and knowledge with less restriction. More of that and a little less of what he thinks a reader might want in the book. 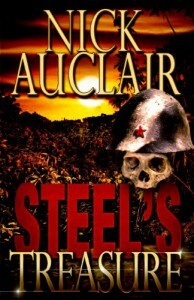 More clarity in plot structure, although this was only the case in the second half.Interested to see where the author takes Steel from here.I received a free copy of this book for my review.